Subject :- Delay in first payment of pension to the pensioners. ii) Identification of pensioner is to be made by bank on the basis of KYC document available with them. 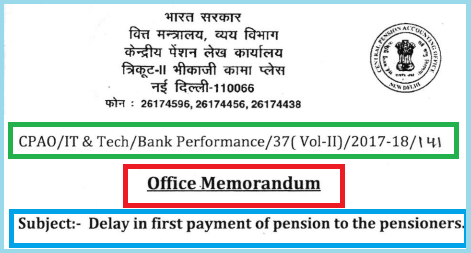 In view of the above, there is no reason for delay in crediting of first pension to pensioners account. Hence banks are requested to strengthen their systems and issue instructions to make sure that timely and correct pension to the pensioners are credited. They are also requested to make a provision for online grievance redressal facility for pensioners to handle their grievance. Hence banks are requested to strengthen their systems and issue instructions to make sure that timely and correct pension to the pensioners are credited. They are also requested to make a provision for online grievance redressal facility for pensioners to handle their grievance.